Great Instructor! Robert has a nice way of explaining things that anyone can understand and easily learn from. Excellent! Excellent! 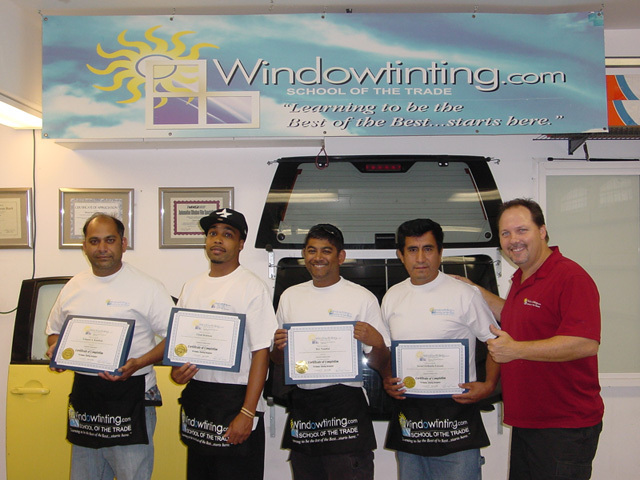 For someone to have only a one-week course to show you how to become a window tinter, I KNOW we were shown the best way to do it! This IS the place to come! A great teacher and a great environment to learn in…Thank you, Robert. I already have 3 trades working in the fields of a major airline, tire service and even the real estate services, but coming into class I knew nothing about the tint, products or reasons for using these items. By the end the course I feel that I have been equipped with the tools and knowledge to be a “Great Installer” and have a fun and rewarding NEW career now tinting auto’s and homes/businesses. Thanks, Robert. I would like to talk more about this but is hard for me to do English. Only thing I can tell you is I am very happy and have a very good teacher.